Republican Richard DeNapoli hosted a Meet and Greet in Venice at the Plantation Golf and Country Club in Venice on Thursday, March 27, 2014. Here are some pictures. A native of Florida, Richard DeNapoli is a Licensed Attorney, Realtor, Mortgage Broker and Notary, Richard has also been successful in obtaining his CERTIFIED FINANCIAL PLANNER® certification. He worked as a Trust and Investment Officer for five years at Northern Trust on a team with $1.8 Billion assets under management providing trust and investment services to individuals and families. Richard DeNapoli is a graduate of the University of Miami School of Law, Fordham Law School, and New York University. He is licensed to practice law in Florida and in the United States District Court for the Southern District of Florida. In 2007, Richard DeNapoli was appointed as a Commissioner to the Florida Real Estate Commission (“FREC”) and subsequently reappointed when that term was up. Both of his appointments to the FREC were confirmed by the Florida Senate. He was unanimously elected to serve as the Chairman of the Florida Real Estate Commission from 2010-2011, and he continued to serve on the Commission for over six years through the end of his term in December 2013. Richard also served as the Treasurer and Chairman of the Broward Republican Party. Recently, Richard has been focusing on his professional career and on his family. Richard is married to Brigita, and they welcomed a new addition to their family, Victor DeNapoli, who was born in August 2012. Richard DeNapoli hosts a meet-and-greet reception in support of his House District 74 bid. The event begins 5:45 p.m. on Thursday, March 27 at the “President’s Dining Room” of the Plantation Country Club in Venice. Admission is free. DeNapoli, the former treasurer for the Broward Republican Party, is running as a conservative Republican to replace term-limited Rep. Doug Holder in the seat covering Osprey, Nokomis, Venice and parts of North Port and Englewood. 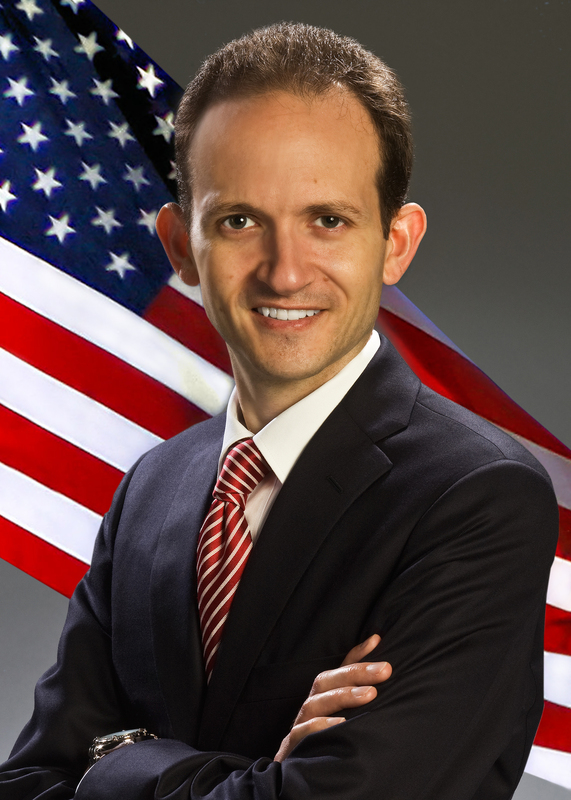 DeNapoli began his political career as treasurer of the Broward Republican Party in 2010, elected chair in December 2012. He has actively championed Republican candidates in both New York and Florida. As Broward Republican Executive Committee Chair, DeNapoli, the Florida native developed a reputation as a strong GOP fundraiser. DeNapoli graduated from the University of Miami School of Law, Fordham Law School, and New York University. He previously served as Commissioner to the Florida Real Estate Commission, and from 2010-2011, was Chair of the Florida Real Estate Commission. Although there is no charge for the event, supporters can donate securely online at www.richardforflorida.com. Nokomis, FL – Today, businessman, former prosecutor, and Republican Party leader, Richard DeNapoli, announced he has officially qualified for the November ballot -certified by the division of elections. DeNapoli becomes the only candidate in District 74 to qualify. Nokomis, FL – Today, businessman, former prosecutor, and Republican Party leader, Richard DeNapoli, announced he will submit petitions to qualify for the November ballot. 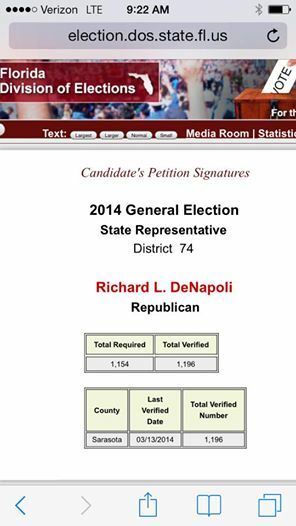 DeNapoli becomes the only candidate in District 74 to submit enough petitions to qualify.